Do you like to make a statement wherever you go? Well then we've got the perfect costume for you! Take a trip down memory lane and relive your childhood in our Adult Big Bird Costume, because the only things that's better than spending your days watching Sesame Street all day is actually becoming one of the character! Whether you want to be the life of the party or maybe you just like to hang out and dress like Sesame Street characters, anything is possible in this bright yellow getup! A crazy costume has never been easier with our 100% polyester, faux fur long-sleeved Big Bird shirt. Just throw on your shirt and your faux fur headpiece with a soft-sculpted felt beak and eyes sand you are instantly transformed into an iconic character from the best years of your life! We hate to break it to you but, you will have to buy your own yellow pants, but hey if you're a true Big Bird fan you've probably already got a pair laying around the house. 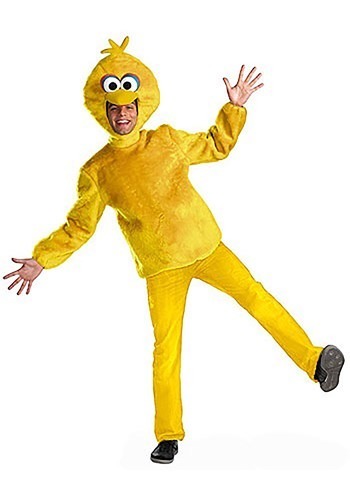 Show everyone how to get to Sesame Street in this Adult Big Bird Costume! Keep your nest clean so you can welcome your friend, Mr. Snuffleupagus. Why not get the whole gang together while your at it and add our Elmo, Cookie Monster and the rest of our Sesame Street costumes!